Consider that zillions come to DC each spring with hopes of seeing cheery cherry blossoms a'bloom - and then find the weather has tricked them. But not everything worth seeing in the city is a tree. The National Museum of African Art this year has a sumptuous earth art exhibit displayed around the Castle and the Enid Haupt Garden that features works of an entirely different sort: inspirations of African artists (some live there; some in the US). 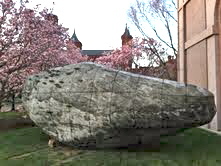 Take, for instance, the multi-textured cement, stone and wood piece that landed like some asteroid beside some early blooming magnolias. Behind it, not far away, is a triangular construction in progress, mirroring in shape the glass dome that erupts on the National Gallery of Art's west plaza - or the Egyptian pyramids and the visions of I.M. Pei when he put angles on the NGA's East Wing. Attaching natural materials in manmade ways to their natural home, the earth. Open to all.